The MISSE-9 experiment complement is composed of 229 individual samples from both commercial customers and NASA. Samples include 3-D printed materials, sensors, sensor components, textiles, carbon fiber laminates, paints, coatings, polymers, and composites. Each sample is custom mounted to decks that are installed in each half of a MISSE Sample Carrier (MSC). There are ten sample decks deployed as part of the MISSE-9 mission. Above is a depiction of what a custom deck could look like. The following provides more detail about the science on the MISSE from the four NASA Centers flying samples on MISSE-9 (GRC, JSC, LaRC and MSFC). POLYMERS AND COMPOSITES EXPERIMENT: Glenn’s MISSE-9 Polymers and Composites Experiment (PCE) is a passive experiment with 138 samples being flown in ram (forward facing), wake (trailing edge) and zenith (space facing) directions. These flight orientations provide different environmental exposures, such as significantly different levels of atomic oxygen (AO). Polymers and other oxidizable materials can be eroded away due to reaction with AO. Therefore, to design durable spacecraft it is important to understand the rate of erosion. This can be achieved by knowing the AO erosion yield (Ey, volume loss per incident oxygen atom) of spacecraft materials. The primary objective of the PCE is to determine the AO Ey of polymers and composites in the space environment. Changes in optical, thermal and mechanical properties will also be determined. The PCE provides important space environmental durability data for Earth and Mars orbiting spacecraft. POLYMERIC COMPOSITES EXPERIMENT: The MISSE-9 “Polymeric Materials Experiment” by Sheila A. Thibeault, Principal Investigator, of the NASA Langley Research Center aims to test the durability of new materials developed for atomic oxygen resistance and radiation shielding. 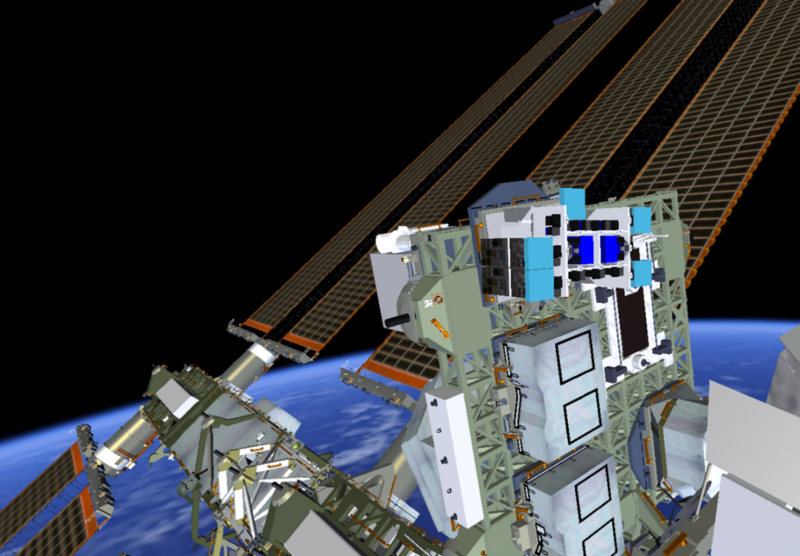 Before materials can be safely used in space, they need to be tested in an actual space environment, such as on the outside of the ISS. Samples of these new materials will be flown in the ram, wake, and zenith orientations for 1 year and then returned to Earth for analyses in ground-based laboratories. The following materials properties will be measured: erosion yield, tensile strength, tensile modulus, radiation shielding effectiveness, and radical concentration. The expected impact of this experiment is to increase the Technology Readiness Levels (TRLs) of these new materials for use in space missions. SPACE SUIT LAYUP: University of Delaware researchers will be testing shear-thickening fluid (STF)-treated space suit layups for improved protection of astronauts performing EVA missions. STF-treated textiles can offer design opportunities for meeting flexibility and vitality requirements simultaneously for the new age space suit to take humans extra terrestrially. The durability of the materials in low-Earth orbit during MISSE-9 will be an invaluable validation step for the technology. 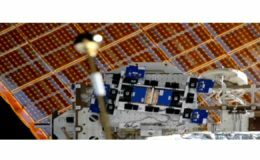 RADIATION RESISTANT POLYIMIDES: New radiation resistant polymers developed by National Institute of Aerospace and NASA Langley Research Center will be tested on the wake side of MISSE-9. The new polymer is the modified Langley Research Center SI (soluble imide) based polyimides showing good space environment resistance. ADDITIVELY MANUFACTURE MATERIALS: Space Effects on Additively Manufactured Materials studies the space environmental effects on 3-D printed polymers and metals. 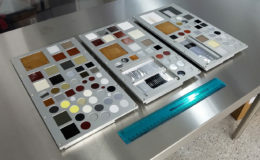 One set of samples matches what can be printed in the ISS Additive Manufacturing Facility (AMF). Other samples will be used to determine how much the printer selection and small changes in the material affect the durability in space. MSFC ULTRAVIOLET RADIATION SENSOR: The MSFC-provided Ultraviolet Radiation Sensor is an improved version of the sensor flown on previous MISSE experiments. The sensor will actively monitor how much the sun is illuminating three sides of the MISSE. RAM TANTALUM CARBON FIBER LAMINATE: The Ram Tantalum Carbon Fiber Laminate Experiment will study the exposure of the Tantalum Carbon Fiber Laminate to atomic oxygen compared to baseline Carbon Fiber Laminate. Space radiation dose comparisons to the baseline samples will be done using thermoluminescent dosimeters, which measure total radiation dose. The Tantalum Carbon Fiber Laminate are atomic number (Z) grade radiation shielding materials innovated at NASA Langley Research Center. This experiment increases the development level of the radiation shielding materials with space heritage. ZENITH TANTALUM CARBON FIBER LAMINATE: The Zenith Tantalum Carbon Fiber Laminate Experiment will study the exposure of the Tantalum Carbon Fiber Laminate to ultraviolet light compared to baseline Carbon Fiber Laminate. Space radiation dose comparisons to the baseline samples will be done using thermoluminescent dosimeters, which measure total radiation dose. The Tantalum Carbon Fiber Laminate are atomic number (Z) grade radiation shielding materials innovated at NASA Langley Research Center. This experiment increases the development level of the radiation shielding materials with space heritage. CHARGE DISSIPATION FILM: The Charge Dissipation Film Experiment is an environmental test in the temperature cycling of the charge dissipation film in a vacuum and radiation environment. Space radiation dose comparisons to the baseline samples will be done using thermoluminescent dosimeters. The Charge Dissipation Film was developed by LUNA Innovations through the NASA SBIR/STTR Program for high charging environments. This experiment increases the technology development level of the charge dissipation film with space heritage. The MISSE will be installed on ELC-2 Payload Site 3 as depicted below. Five MSCs host the MISSE-9 experiment complement. Click here for a PDF version of the MISSE-9 write-up.